There are loads of different types of wood for use on different jobs.
" The Forest Stewardship Council enables you to buy forest products of all kinds with confidence that you are not contributing to global forest destruction." Soft wood is used in a huge range of general constructional jobs. In the UK It's usually pine or spruce. It's cheap and very easy to work with. Although some care is required to avoid it splitting when nailing, screwing into, sawing or drilling. Sawn treated -quite roughly presented this is used for outdoor use and is pressure treated with preservative to help prevent rotting. Used in fencing a lot. You can usually tell it's treated by it's slightly odd colour usually a browny or greeny tinge to it depending on the color of preservative. 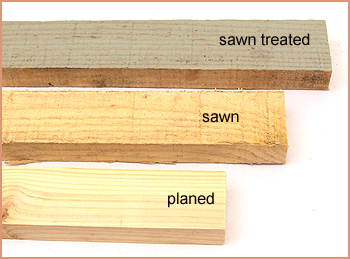 Sawn - quite roughly presented often use where you won't see it like stud walls which are covered with plasterboard. Planed - nice smooth surface used for precision joinery or where you see the surface. eg. door frames, skirting. Hardwood is much more expensive than soft wood and is used in more quality joinery jobs, expensive flooring, or outside areas which are exposed to the weather like front doors. It's often used on expensive window frames as it looks great and last for years. On floors it's very hard wearing. Being harder it's much harder to work with but you can get a great finish on. It doesn't split nearly so easily as pine. Examples are beech, oak, mahogany. Various types are available and all usually come in thickness' of 4 mm, 6mm. 9mm. 12 mm. 15 mm. 18 mm. 24 mm. A large sheet will be 8 feet x 4 feet which will be the size you get from a builders merchant. DIY stores will usually supply smaller sizes as well. 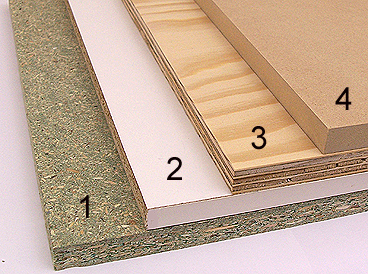 MDF (medium density fibre board) very popular these days. It's made from powdered wood which is bonding with glue and compressed to form the sheets. Used widely for interior projects especially cupboards and shelving. It's quite soft and very easy to work with. It cuts and sands very easily and you can get a great paint finish on it. It's not particularly strong when cut in thin strips for shelving so will need support if you want long lengths. It gets' very dusty when sanding it so you'll need to where a dust mask. It hates moisture and will swell up if it gets wet. Don't ever use out side or areas likely to get damp. I tend to use the 18mm thickness size a lot for shelves and cupboards. NB you can now buy MDF with a wood veneer like cherry, oak, etc. These are quite expensive but do look great. Tip a lot of timber suppliers have cutting facilities. They use very large saws which cut lovely square edges very accurately. On shelving or cupboard projects it's well worth getting sheets cut down to your own requirements. It's a lot less hassle than struggling with large sheets especially if you have limited space. Chipboard Made similarly to MDF but from actual wood chips. Used widely by kitchen manufactures who cover it with a laminate. Also used widely for low cost flooring You can buy flooring packs in different sizes which come tongue and grooved which allows each section to slot together with the next before screwing or nailing down. If used for shelving It's fairly weak so needs well supported. It doesn't paint very well and the edges are quite rough. I rarely use it these days for shelving, though it is very cheap. Plywood This is made from thin laminates of wood glued together each layer at right angle to the grain of the other. It' very very strong but also quite flexible, especially if you get thinner sheets. It's used widely in the building industry as it's so strong. Used for things like boxing in, sub floors prior to tiling, and loads of other things. It's tougher to work with and the edges tend to fray a bit when sawn. It doesn't paint up very well. Best used where it's not seen. It's quite expensive, especially if you buy the most expensive, marine ply, which is very good quality and quite water proof. Conti board This is laminated chipboard available in white or various other colours and finishes. Used widely in kitchen carcases You can usually buy it in 6 feet lengths of various widths. Can be use for shelving but will need plenty of support. Inexpensive. A relatively new wood product has become available over recent years which combines wood with plastic to provide a new and very interesting composite wood.. This type of wood is especilly useful in outside spaces. Composite wood products are a blend of powdered wood and powdered polyethylene. They are bonded together to form a strong weather reisitant product. Decking, cladding, fencing are readily made from these composites which come in a variety of colours and finishes. Some mimic traditional wood so you get the natural feel of wood, the plastic provides strength and durability. Decking is especially popular in gardens and provides a very cost effective useful "outside living area"
The benefit of composite wood decking is that it it provides a low maintenace alternative which is hard wearing but is also great looking. Eco-friendly composite wood timber products like those from Timco woods are made from recycled wood and recycled plastic. They also offer a 25 year warranty.